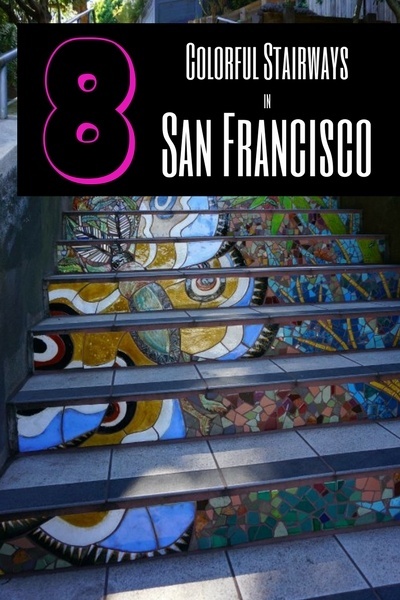 Explore these eight colorful, famous stairways of San Francisco. They include four mosaic sets of stairs, the Sand Ladder near Baker Beach, the Filbert Street Steps near Coit Tower, plus a few surprises. Read on for details about and tips to find these hidden gems in SF. 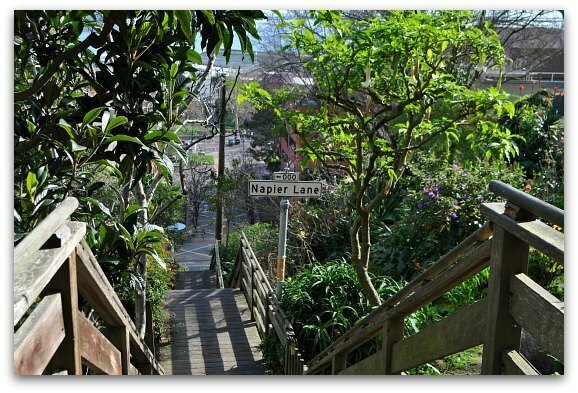 The Filbert Street Stairs are a set of staircases that take you to the top of Telegraph Hill from the waterfront near Levi's Plaza. It's a popular route for those wanting to get from The Embarcadero up to Coit Tower on foot. The first set of stairs is VERY steep. They climb up the side of a hill and it's the toughest part of the journey. They start on Filbert about a half block west of Sansome Street. This is where Filbert dead ends and the stairs begin. They are hard to miss! Once you climb this first set, you will be taken through a lovely garden area with wooden steps. These are two distinct sets of staircases within your first block. You will then cross Montgomery Street, where you will find your next set of steps. Continue walking up hill until you reach Telegraph Hill Boulevard. 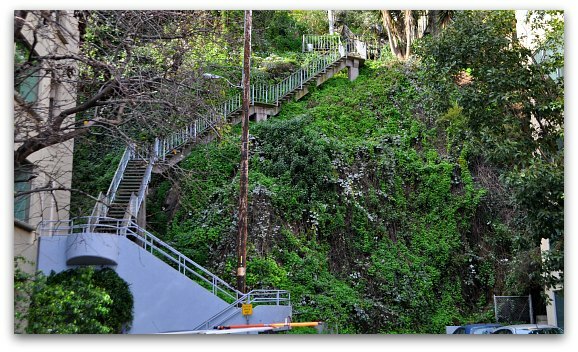 This is where you will hit your final staircase that will take you up to Coit Tower. As you walk, make sure to stop for a rest as this walk is quite strenuous. During your stops, make sure you turn around for the gorgeous views of the SF Bay and the Bay Bridge. 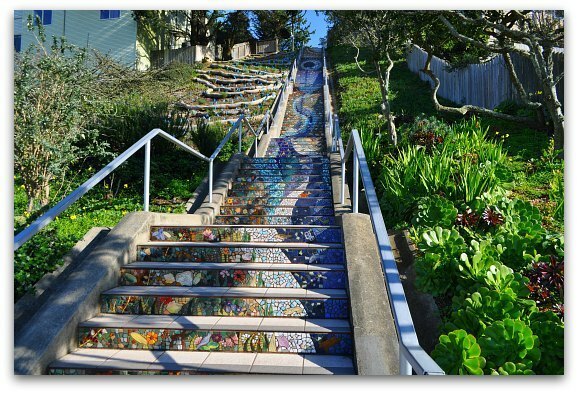 At 16th and Moraga, you will find the most famous set of mosaic stairways in San Francisco. This set of stairs is on Moraga between 15th and 16th Avenues. This 163 step beauty was completed in 2005. This community project was worked on by more than 300 neighbors. It's was a labor of love and you can tell in the final design. The stairway is broken into small sets of stairs. Each one has a different design such as a moon, a sun, and swirling designs with fish, flowers, and shells. It's amazing to see the entire piece, but also to walk up and down to get a closer look at each section. Transit: You can easily get here by car or by public transit. Take the N Judah light rail to Judah and 15th Avenue. Walk to 16th Avenue and head up the hill. Don't miss the Hidden Garden Steps (mentioned below) on the way! One of my favorite views of the San Francisco Bay is from the Lyon Street Stairs. This attraction starts on the top at Broadway Street and makes its way from Pacific Heights down to the Marina District. 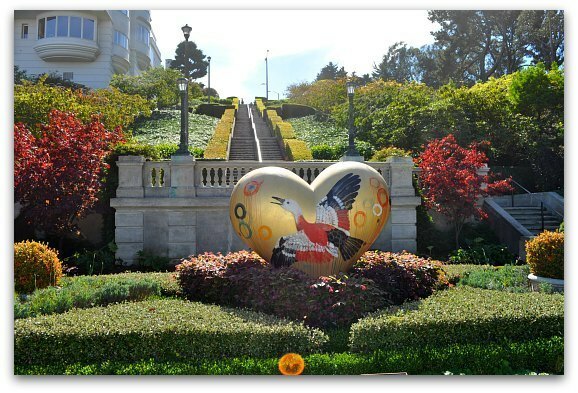 The first block of stairs is beautifully manicured with one of the Hearts of San Francisco near the bottom. The second set of stairs is more basic and steep, but takes you quickly from one district to the next. Transit: Take the #3 Bus to Jackson and Baker Streets, from there walk up the hill two blocks to Broadway and take a left. This two block walk is steep, so make sure to wear comfortable shoes and take it slow. 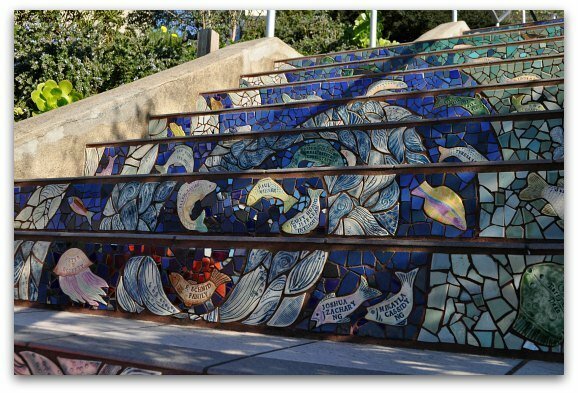 Another set of mosaic stairways in San Francisco is the Hidden Garden Stairs. This set of stairs was completed in 2013. This one is also broken up into several sets of steps. Each section features a design with flowers, butterflies, leaves, and other items in a garden. You will find almost a dozen different sections with unique designs. Transit: Take the N Judah light rail train to the stop at 15th Avenue and Judah. From there, walk to 16th Avenue and make your way up the hill. 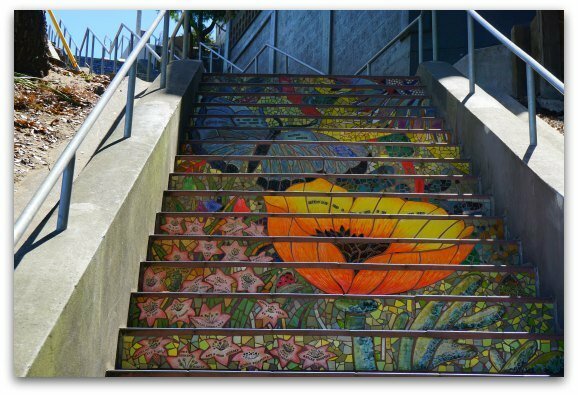 Once you check out these stairs, walk all the way to the top to continue on 16th Avenue until you reach the 16th Avenue Tiled Stairs (at Moraga). 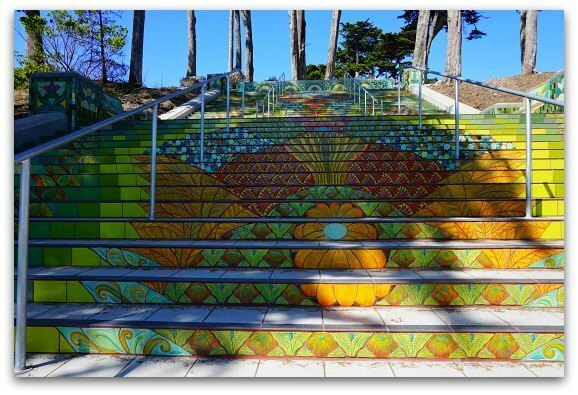 The newest set of mosaic stairs in SF is the Lincoln Park Steps. They are on California Street where it dead ends into the Lincoln Park Golf Course. It's a smaller staircase, but offers a colorful patter of bring yellows, greens, and oranges. This set of stairs does not have an official name, but it's the best way to get between Fort Point/Crissy Field and the Golden Gate Bridge. It's part of the Battery East Trail and you will find several signs that take you between these landmarks. The great thing about the stairs is that they offer a short cut between these two locations (instead of walking along the road). 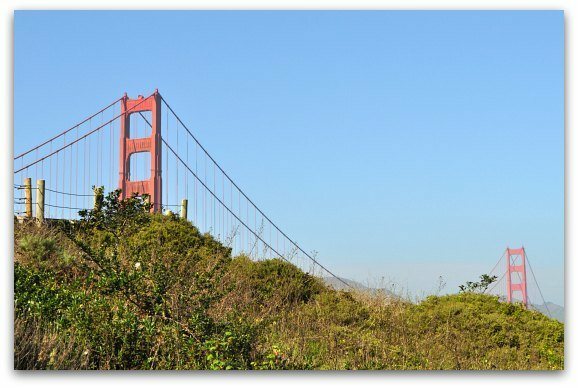 You will also get some amazing and less common shots of the Golden Gate Bridge during your walk. 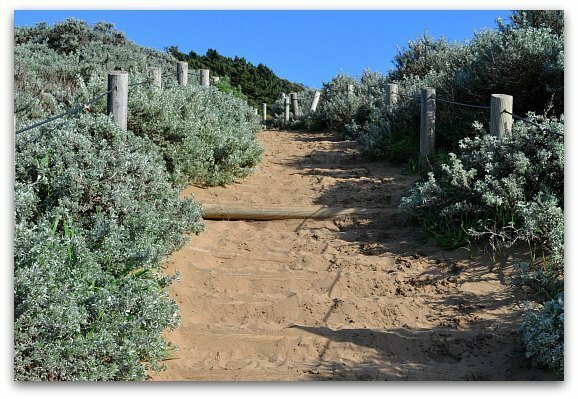 The Sand Ladder is a set of stairs covered in sand. Its part of the Pacific Coast Trail and has become famous as its one of the toughest parts of the run during the Escape from Alcatraz Triathlon. It takes you to the northern end of Baker Beach. 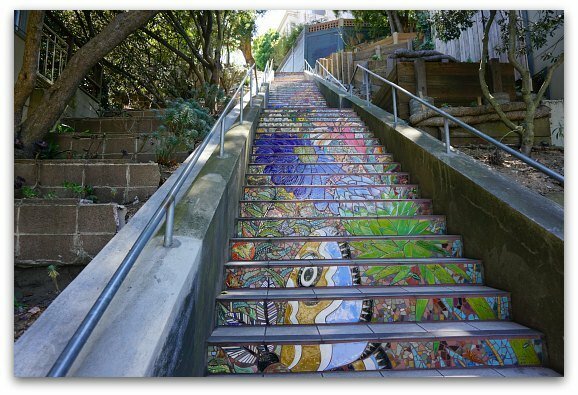 The last set of stairs is the Flights of Fancy Staircase in the Bayview District. This set of mosaic stairs was completed in July of 2014. It's a dedication to Dr. Arelious Walker who was a former pastor and advocate for the Bayview District. The design is a combination of patterns from various cultures including Adinkra cloth from Ghana, Native American painted pottery, and woven patterns from Central America and from the Middle East. The 87 step staircase connects Northridge Road and Innes Avenue. Transit: Take the #19 Bus to the stairs, you will be dropped off right at the bottom of the staircase. There isn't anything else around this area, so hop right back on the #19 after it turns around a few blocks away. It takes the bus less than 15 minutes to return, so I recommend taking a quick look, getting some pictures, and hopping right back on.